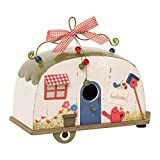 This quirky bird house is in a colourful caravan design and makes an amusing focal point for your garden or courtyard or a charmingly unusual gift. The design features a wooden body in a caravan shape with two rear wheels and a front stabiliser and is finished with a realistic tin roof and small rear door allowing easy cleaning. The camper is decorated with two windows, garden ornaments and a welcome sign by the door. The caravan’s metal hanger is decorated with a gingham ribbon, colourful crystals and two small bells. Measurements (w x d x h): approx. 26 x 13 x 23 cm.